I think it says something good about mainstream food culture that a cookbook jacket can now not only not display something baked and golden-brown on the cover but actually instead feature a blue-black close-up of octopus tentacles. My daughter was very concerned about the octopus, but – though I love me a cephalopod – we didn’t test any this time. 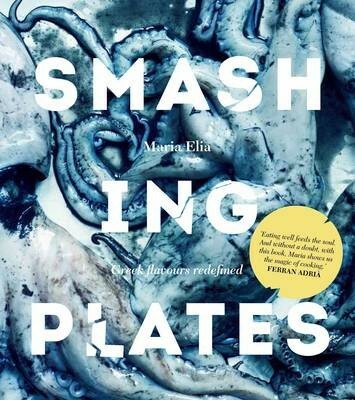 From Maria Elia’s last book, I knew to expect big flavors and new ideas, and Smashing Plates – mostly – did not disappoint. Click here to read today’s review of ‘Smashing Plates’ in the Boston Globe. Hit the paywall? Click here for the PDF version. On Cookbook Finder, my cookbook-rating app, you’ll find write-ups of 250+ of the latest cookbooks, and regular cookbook news. It’s the only up-to-the-minute cookbook app anywhere! It was summer of 2005 when I wrote my first story for NPR’s Kitchen Window, a then-brand-new series on the NPR website. It was my first time working with NPR in any capacity, and I was beyond thrilled. In the 9 years since the series launch, I’ve written regularly for Kitchen Window, most of it under the sage guidance of editor Bonny Wolf and producer Amy Morgan. For me, it’s been 62 stories in all. I’ve written about octopus, egg yolks, squash blossoms, edible weeds, and mint ice cream (I finished that one the day before my second child was born). I’ve baked my way through Halloween (soul cakes), Valentine’s (iced heart cookies), Easter (egg breads), and Mother’s Day (waffles and scones). I’ve enjoyed heartwarming praise and endured withering critiques from hundreds of readers. And the kind of stories I learned to tell here formed the basis for my book, A Spoonful of Promises. Next month, the series will conclude. This story, about the sous vide revolution lapping at the thresholds of home kitchens, will be my last Kitchen Window contribution. My first piece, Garden in a Glass, was a nostalgic reverie about the medieval art of herbal concoctions. It seems somehow fitting that my last should be such a modernist, future-forward piece, complete with thermocouples and vacuum sealers. We’ve come a long way in 9 years, both the food world and I.
NPR continues to provide excellent food coverage through The Salt blog, especially when it comes to food science, food sourcing, and food trends. But I hope that NPR will someday once again have a place for the thoughtful rumination on food – the essay that takes us out of time and place and into a moment of pure sensibility. As the immortal M.F.K. Fisher once wrote, “When I write of hunger, I am really writing about love and the hunger for it…” We live in a world frantic for connection, and sometimes it’s only food – primal, comforting, sustaining – that has the power to stop us in our tracks; to taste, to remember, to feel. Click here to read Sous Vide Makes Its Way to the Home Kitchen at NPR’s Kitchen Window. Or, if you like, browse all my Kitchen Window stories for NPR. This story features a pork belly recipe from Nathan Myhrvold’s and Maxime Bilet’s Modernist Cuisine at Home. You can read more about this book – and over 250 other cookbooks worth getting or giving – on my cookbook-rating app, Cookbook Finder. Available for both iPhone/iPad and Android devices and updated regularly. Lumpy, who does not lay. Lumpy, the non-laying Barred Rock hen. This is Lumpy, who does not lay. In the two years since I first became a flockster, I’ve often known who was laying what. 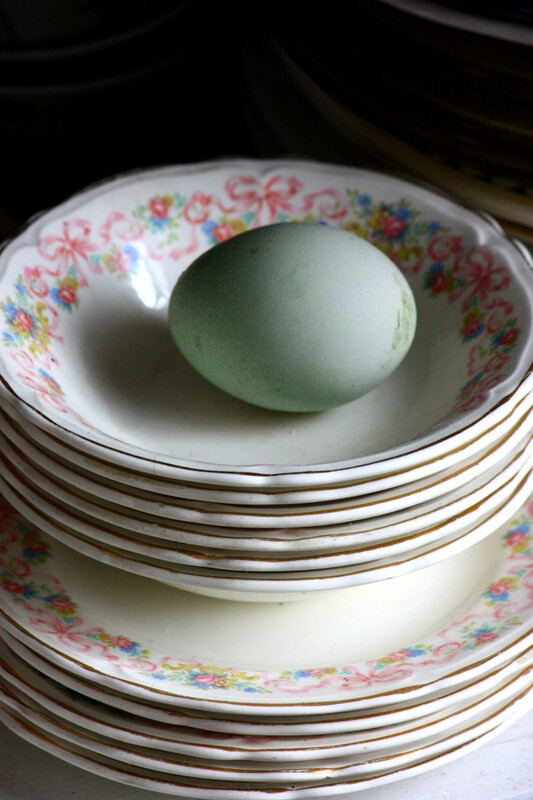 The two Easter Eggers laid distinctive blue (Spalty) and green (Feather) eggs. 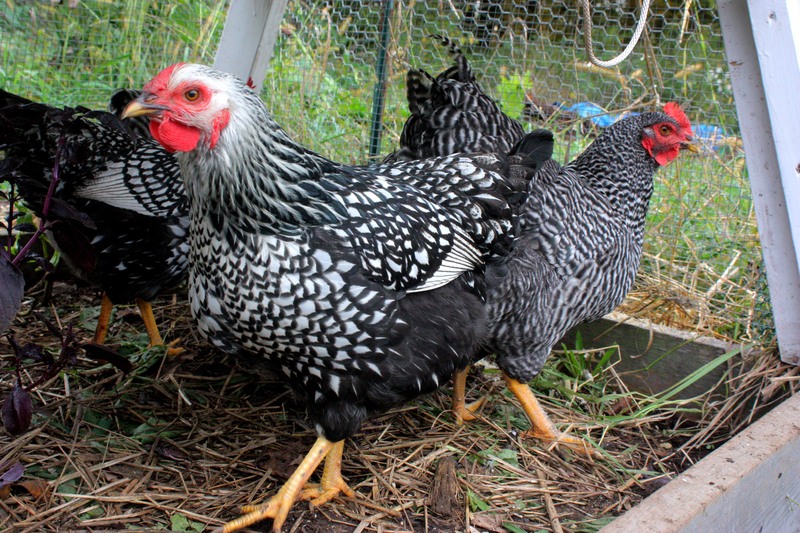 The two Wyandottes laid smallish golden-brown (Stormy) and pinkish-speckled (Stripèd) eggs. 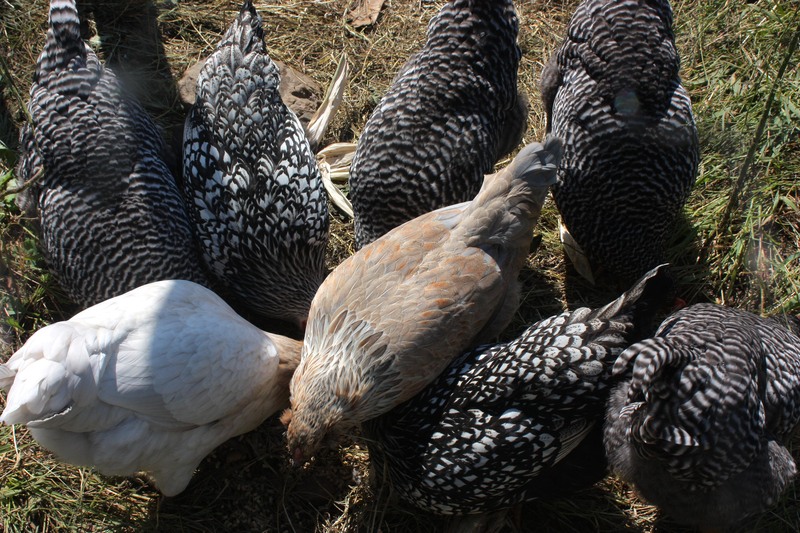 But the 4 Barred Rocks – One Patch, Two Patch, Lumpy, and Jumpy – were so alike in every way, their habits and nesting preferences and their pale brown eggs so similar, that I was never quite sure. After One Patch went to the big coop in the sky last year, I thought I’d figured it out. Not counting the Easter Egger and Wyandotte eggs, I had, I thought, three other kinds: a very regular-shaped extra-large egg, a slightly elongated, blimp-like egg, and an enormous egg with a “sleep wrinkle” on one end. Jumpy, Two Patch, Lumpy, I thought. But after the March chicken massacre, the only Barred Rock left was Lumpy. And every morning since that awful day I’ve looked for her enormous “sleep wrinkle” egg, to no avail. The other two survivors, Feather and Stripèd, continue to offer up their pale green and pinkish-speckled treasures about 3 days out of 4. But of Lumpy’s egg – or what I thought was Lumpy’s egg, anyway – no trace. Lumpy’s a healthy bird, with bright black-and-white feathers (especially glossy and vivid after the last winter molt), a symmetrical comb, and elegant small feet. She’s talkative, too, with a musical voice and a funny cry that sounds like the original Star Trek intercom whistle. All in all, she’s an easy girl to like. And I know she used to lay, because there wasn’t a hen in my flock I hadn’t caught in the act at one point or another. But right now, she’s not doing her job. So this brings up the question: what do we do with layers who don’t lay? Another kind of household would have an obvious answer: stew pot. And I’m sure my bloodthirsty, bottomlessly hungry teenage son would agree. But when the word stew pot comes up, I inevitably counter, lawn mower. This is because one thing even a non-laying hen can do is keep the grass from encroaching into the garden in the summer. The Barred Rocks are pretty flightless (one reason they were easy pickings for the neighborhood dog, I guess), so they’re especially good at staying inside the fence and snapping off the grass tips, one blade at a time. It’s slow, but they’ll do it all day. They never get bored. But the fact is, even if Lumpy weren’t a pretty good lawn mower, I’d probably have to keep her anyway. Friendly, harmless, not the most productive, occasionally entertaining – somehow, when I go down this list of Lumpesque qualities, it seems terribly familiar. In that remorseless middle-aged way, I think to myself: Who else isn’t living up to their potential? Shouldn’t I be doing more in life than just, sort of, getting along? Is it OK to be an affable person, essential to my family, of value to some friends? To produce a small body of work that brings pleasure to a few? Is it enough? The answer, of course, is yes – it has to be. Because if I spend my life worrying about not enough, in the end I really won’t have anything to show for myself. It’s just one reason – perhaps the most intangible, but perhaps the most secure – that Lumpy won’t be getting the axe. Still I hope, for all our sakes, that one morning I’ll go out to that empty, haunted nest and find it: one enormous, sleep-wrinkled egg – the work of a day; the justification, however disingenuous, for a life. 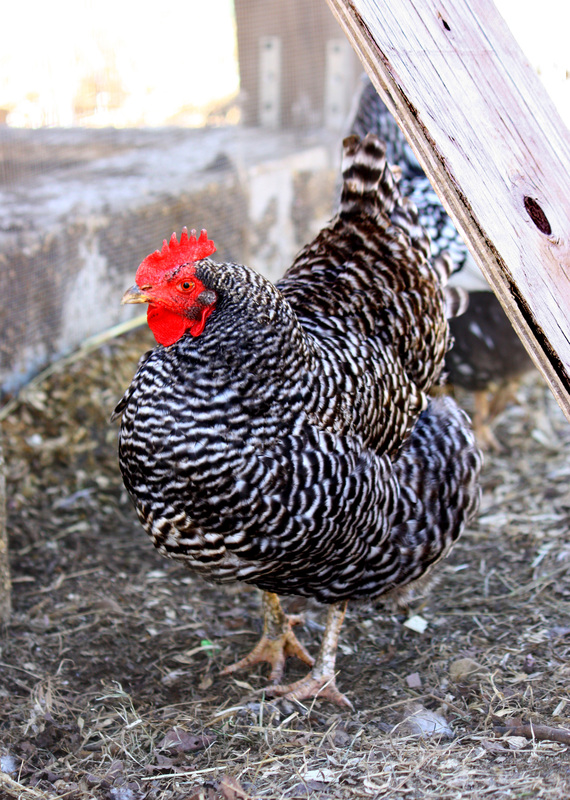 This last weekend, we suffered a predator attack – our first since we first got our chickens exactly two years ago. It must have happened in broad daylight, while we were inside the house, laid up with stomach bugs. But none of us heard a thing. 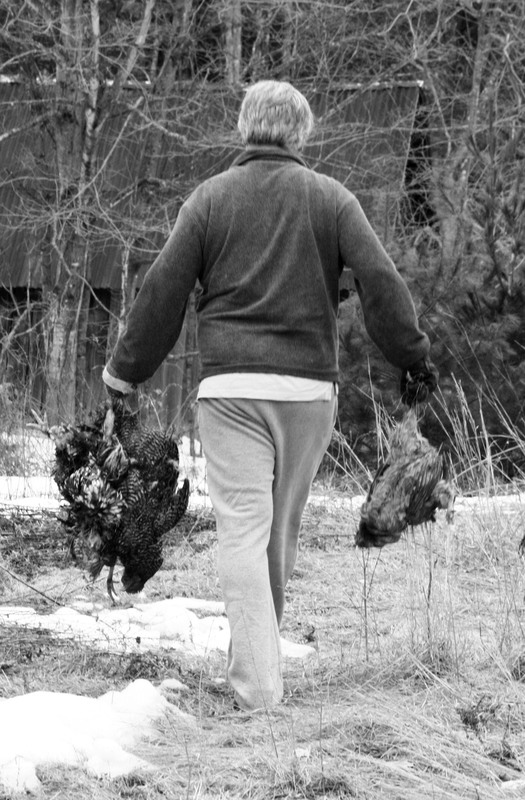 When R went to check on them for the afternoon, he found 4 carcasses inside the fence. Only one had been well and truly savaged; the others, it seems, were merely killed for sport. 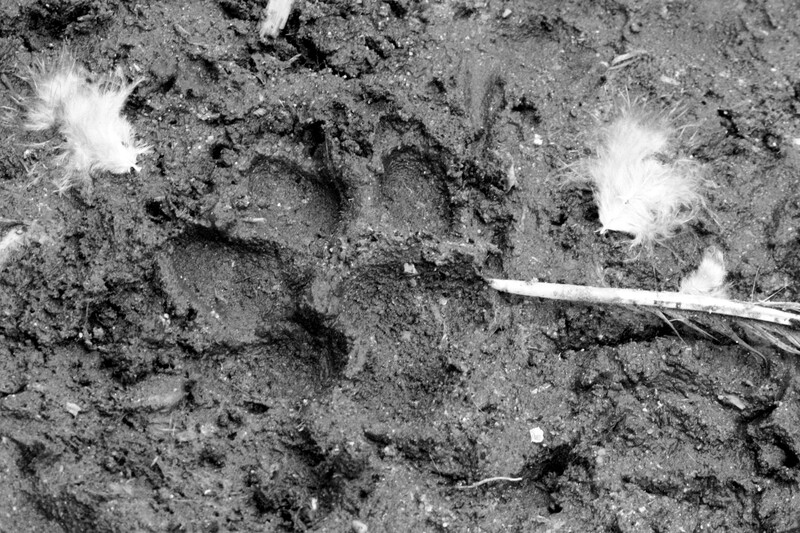 Amongst the drifts of fallen feathers, we found the muddy prints of a very large dog. Our coop is a fortress that had served our birds well till now. We have seen predator prints in the snow, pacing the coop, only to find it impregnable from above, around, and below when closed. But the door had been propped open for the day, and the hens were enjoying the first few days of scratchable, bare earth after an interminable winter. After the dog jumped the netting, the hens must have run for the open coop in panic. Judging from the feathers lining the floor, the dog followed them in. Any hens that didn’t make it up the narrow ramp to the upper floor didn’t stand a chance. They were only chickens, but in a small flock you’ve raised by hand, the losses hit hard. Spalty the Easter Egger was our one blue egg-layer – she gave us a lovely pale turquoise egg with a matte finish, and she was one of our cleverer birds. As a chick, her plumage was dotted and stippled like spalted maple, and that’s how she got her name. She nearly died last summer after eating something she shouldn’t have, but made a full recovery; and she was always the first to find a patch of chickweed or steal a strawberry or learn anything new. The original flock, in happier days. Jumpy and Two Patch were Barred Rocks – docile and friendly, though Jumpy was rather thick. As a chick she was adventurous – the first to jump out of the nursery (hence the name), the first to catch an ant. She grew to be the biggest of our birds, with giant feet and a wobbly, crooked comb. She could scarcely figure out how to exit the coop in the morning for her feeding – she’d bonk her head repeatedly against the corner opposite the door because it had a clear view out to the yard. Clumsy as she was, she was a reliable layer. Unlike Two Patch, who laid oddly pointed, elongated eggs and would squat beneath your hand with a nervous stutter step. 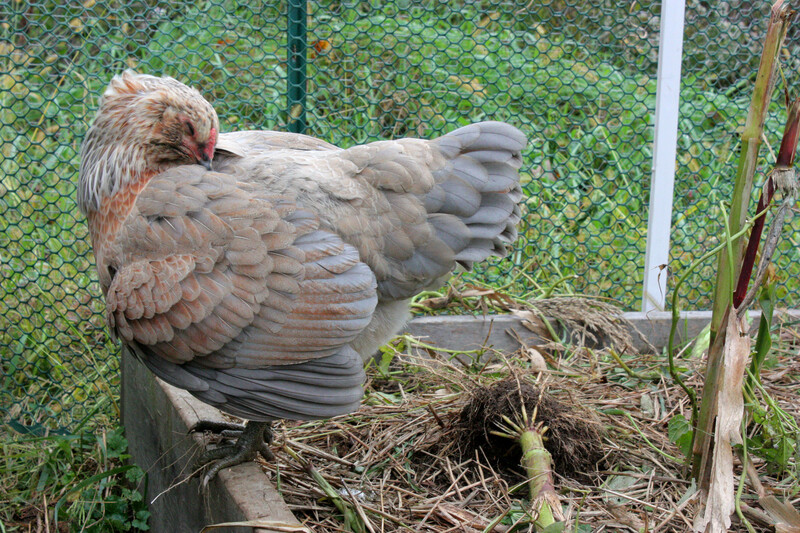 I’ll especially miss Stormy the Silver Laced Wyandotte, who used to come running when she heard me weeding the garden beds. She’d forage for bugs right beneath my fingers, and she laid beautiful golden-brown eggs. After this year’s molt she grew skittish and would linger back in the coop when the others came out to greet me, as if she had a premonition that it wasn’t safe Outside. Alas, she was right. Of our original 8 chickens, only 3 survive (One Patch died of a mysterious illness last year). We have one of each breed, now. The children’s favorite, Feather the Easter Egger, is still with us, still offering up an olive-green egg almost every day. So are whistling Lumpy and the speedy Stripèd, who is our escape artist and was hiding through the attack. If there’s any consolation to be found in the timing of this disaster, it’s that it happened before the order deadline for new chicks this year. So in a month or so, we’ll be bringing in new little feathered friends – tiny souls to pamper, nourish, shelter, and delight in, and, eventually, to mourn. But hopefully not for some years. It’s not often that the Globe runs a vegan cookbook review (although we regularly run vegetarian and vegetable-centric reviews). I think the last time was 5 years ago. The book I reviewed at that time was underwhelming, and I got slammed by assorted irate vegans who felt the author poorly represented their cause. An unfortunate experience all around. But when Isa Does It crossed my desk, I had a good feeling. 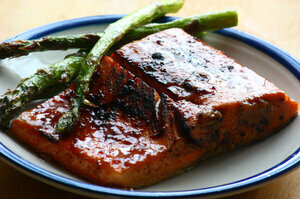 It seemed approachable, well-thought-out, and potentially tasty. So I made the case to my editor that we should review it. She agreed, and I haven’t regretted it…so far. 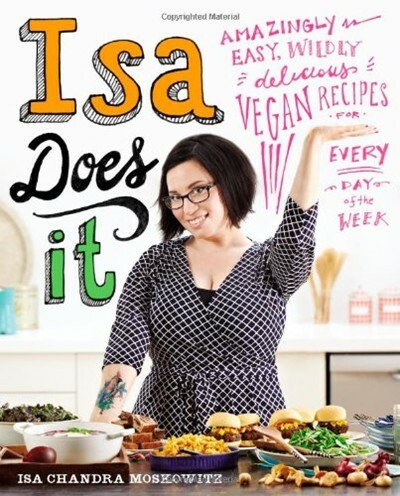 Click here to read today’s review of ‘Isa Does It’ in the Boston Globe. Hit the paywall? Click here for the PDF version.